Business Goals is a three-level course in communicative Business English. Each Students Book provides 30 core hours of class work extendable to over 60 hours using the additional material provided. Functional language, vocabulary and grammar are introduced in manageable amounts. With a focus on listening and speaking, learners are given the opportunity to build their confidence in areas such as telephoning, ordering, networking and dealing with problems in authentic business contexts. 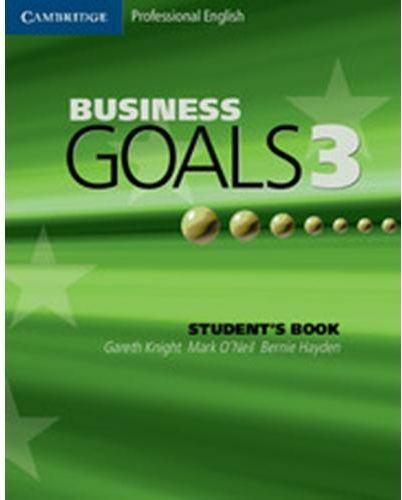 The Business Goals Workbooks provide extra practice in all four skills and are also valuable for students preparing for the BEC examinations, with BEC-style activities and exam advice. Each Workbook comes with an audio CD and contains full transcripts of all recordings. Model answers for speaking tasks are included on the CD. An overview of how the Workbooks link to BEC exams is available on the Business Goals website.